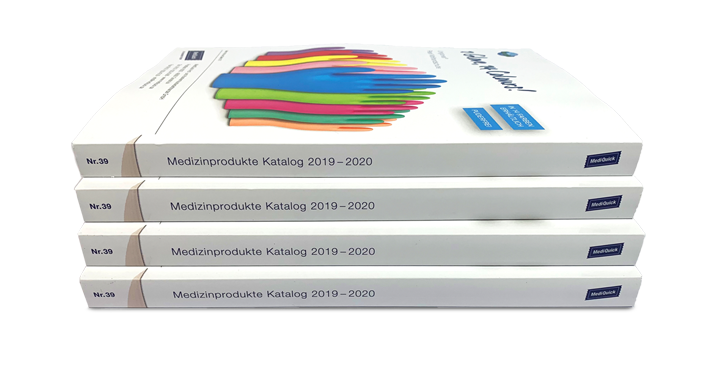 MediQuick, the specialized trade for medical products from Osnabrück, has been a competent partner for the successful day at the surgery since 1984 and is one of the three largest mailorder companies in Germany. Its customers are doctors, hospitals, MVZs, health insurance companies and medical facilities. We have produced the product guide for MediQuick. We were responsible for the redesign of the catalogue with a modern consistent and above all clear design. Layout, concept and printing process – from one single source. The almost 500 page catalogue shows over 170 manufacturers with over 13,000 articles and is divided into 9 chapters plus table of contents, service pages and order faxes. It will be sent to customers with a circulation of 10,000 copies.